Plum juice contains essential vitamins, nutrients and dietary fiber that you and your baby need. Although there are similarities between the two juices, plum and prune juice have distinctly different tastes. Consuming plum juice is generally safe during pregnancy, unless there are high amounts of sugar in the brand you choose. Consult your obstetrician or midwife about plum juice and a balanced diet during pregnancy. A balanced diet made up of whole grains, fresh fruits and vegetables, dairy products and lean protein is essential during pregnancy. Fruit juices, such as plum juice, provide fluids and vitamins for you and your baby. One or two servings of fruit juice per day can count as a serving of fruit, but shouldn't replace fruits on a regular basis. Keep in mind that fruit juice, including plum juice, is more concentrated and higher in calories than a piece of fruit. 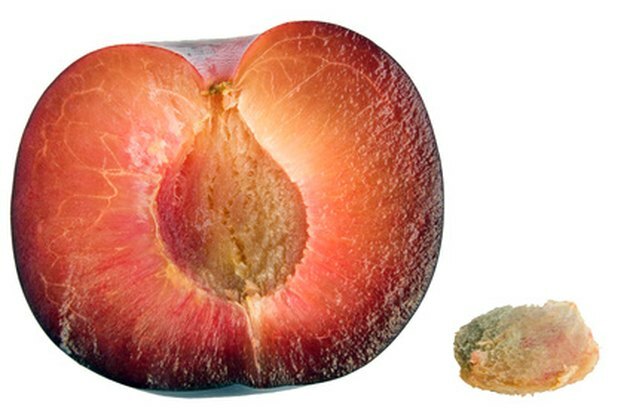 Like prune juice, plum juice is high in dietary fiber. One 8-oz. glass of PlumSmart plum juice contains 3g of fiber. Although plum juice is less concentrated than prune juice, drinking plum juice can help digestion problems during pregnancy. Drinking plenty of fluids throughout the day can help relieve uncomfortable constipation that often comes with pregnancy. Consume one or two glasses of fruit juice, such as plum juice, in addition to eight or more glasses of water each day to improve digestion. Plum juice contains multiple vitamins, including vitamins A, C and K. Vitamin A is essential for bone growth, eyesight, cell division and reproduction for both you and your baby, according to the National Institutes of Health. Too much vitamin A during pregnancy can lead to toxic symptoms, including birth defects. Vitamin C, or ascorbic acid, helps your body fight infection during pregnancy and promotes tissue growth, while vitamin K helps prevent blood clotting. Essential nutrients found in plum juice include calcium, iron, potassium and magnesium. Pregnant women need 1,000mg of calcium during pregnancy, which contributes to the growth of your baby's teeth, bones and heart. Calcium causes muscles to contract, while magnesium helps relax muscles. BabyCenter states that healthy levels of magnesium may help you avoid premature contractions. Although iron contributes to constipation during pregnancy, the essential nutrient also boosts your immune system and protects you and your baby from viruses. Potassium is essential during pregnancy to help maintain healthy fluid levels and electrolyte balance.